(C) ESI PHOTOGRAPHY. 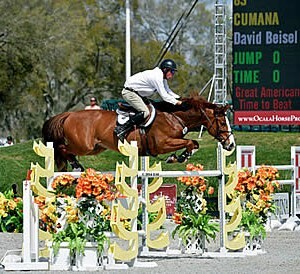 David Beisel and Cumana. Ocala, FL (March 19, 2016): Riders went head-to-head for a shot at the winning title and the lion’s share in Ocala Week IX’s $2,500 Brook Ledge Open Welcome and $25,000 SmartPak Grand Prix. David Beisel of Goshen, Ohio gave a lesson in turning and burning on his way to victory in the $1,500 Brook Ledge Open Welcome to kick off the penultimate week at HITS Ocala. Beisel and Cumana, owned by Kara Cooke, blasted the competition by a full second over his nearest competitor. Course Designer Marina Azevedo of Sao Paulo, Brazil set a 1.45-meter course of 17 efforts for the 39 starters, many of whom are preparing for the $100,000 Sullivan GMC Truck Grand Prix this weekend and the Great American $1 Million Grand Prix next week on March 27. With a class chock-full of talented competitors, including Brook Ledge Leading Rider, Aaron Vale, and returning Week VI Brook Ledge winner Matthias Tromp, the battle for the blue was on. Twelve horses jumped first round clears and nine jumped clean over the shortened course, which started a serpentine pattern from the first oxer to a vertical, then another oxer, followed by a to the outside line. The course finished with a left turn to a final oxer. First to jump double-clear was Derek Petersen from Archer, Florida riding his own Diamant’s Legacy. Putting down an impressive, tone-setting round, they sliced each turn and angled across every jump to set a Great American time to Beat of 28.539. They held on to the top spot through the next 16 competitors, but would ultimately place fourth in the ribbons. Hyde Moffat of Brantford, Ontario, riding Egor, owned by Martha Younger, was the next to jump double clear, but his time of 30.614 was two-seconds shy of capturing the lead, eventually placing fifth. Next to contest the shortened course was Aaron Vale of Williston, Florida aboard Carlo, owned by Amatoville Enterprises. Vale was a man on a mission as he angled the first jump at a gallop. He and Carlo sliced and diced their way to a time of 28.426, edging out Petersen by a fraction of a second to garner the lead. Their round would eventually land them the third place prize. Twenty-third in the order was winner David Beisel riding Cumana. Beisel set up his first round course to prepare for the jump-off, with tight, snug turns that beckoned cheers from the crowd. Matthias Tromp, winner of the Brook Ledge Welcome in Week VI, and KM Whatever RV, owned by the Beyaert Farm, gave Beisel a run for the money, riding the serpentine pattern as straight as possible. Early in the course it looked like Tromp might steal the lead, but a final time of 26.945 put him in second. The 2016 Ocala Winter Circuit is building steam to its grand finale with the Great American $1 Million Grand Prix on Sunday, March 27. A class full of this circuit’s $25,000 SmartPak Grand Prix winners competed for another title, but it was Hunter Holloway from Topeka, Kansas and VDL Bravo S, owned by Hays Investment Corporation, who claimed the blue after knocking on the door all season. 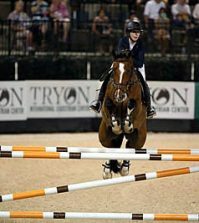 Holloway finished Thursday’s $25,000 SmartPak Grand Prix with a win with VDL Bravo S to head into the weekend’s $100,000 Sullivan GMC Truck Grand Prix on a high note. 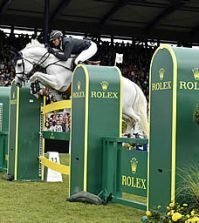 Winner of Last week’s $50,000 Purina Animal Nutrition Grand Prix, Tracy Fenney of Flower Mound, Texas, had a strong second place performance with MTM Reve Du Paradis. Course designer Marina Azevedo from Sao Paulo, Brazil set a challenging track of 16 efforts that “tested the ride-ability and the scope of the horses,” according to Holloway. 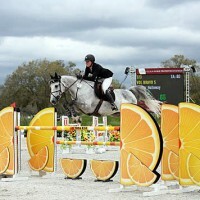 The jump-off course started by heading toward the in-gate over an oxer, rolling back and away over a five stride line. The course continued with a bending line to a mid-course oxer, back around over the combination at 9A and B and finished with a right rollback over the final vertical. 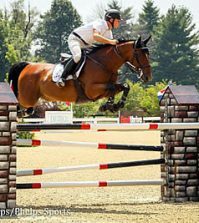 First to go in the jump-off was Matt Hollberg of Middleburg, Virginia and Viriato, owned by the Southern Cross Equestrian Center. 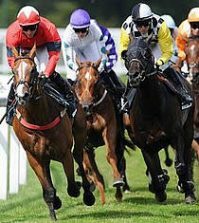 They sailed around the course, setting the Great American Time to Beat as they crossed the timers in a fault-free 34.131. 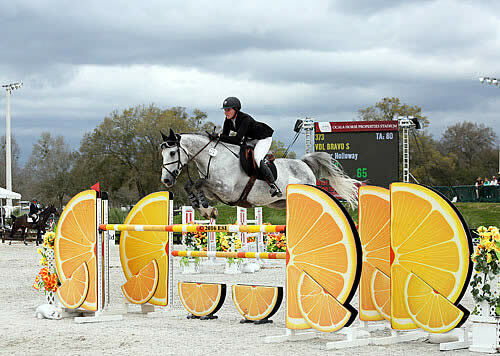 Next to contest the shortened course was Mathew Williams of Wellington, Florida aboard Valinski S, owned by Michael Dorman and Wyndmont Farm. They finished just a tick slower in 34.403. Amanda Flint from Long Valley, New Jersey jumped next on her VDL Wittinger, a winner in this class just three weeks ago. An unfortunate rail at the mid-course oxer would eventually earn them sixth place as they crossed the markers in 37.420 with four faults. Devin Ryan, also from Long Valley, New Jersey, jumped a clean trip on his mount Liratus and also opted to leave out a stride in the bending line to the oxer; his time of 33.884 was not enough to steal the lead from Fenney.